Asakusa is one of the must-see spots in Tokyo. And while many tourists go to Asakusa during the crowded daytime, local people go out to Asakusa at night to experience the bar culture. Many Japanese "salary-men" go out in Asakusa after work. You'll learn about various kinds of local alcohol like beer, sake and shochu, and you try many different Japanese foods as well. Let's go bar and Izakaya-hopping among Japanese locals! After the tour, you'll be like a Japanese local! Maybe one of the most touristic places in Tokyo is Asakusa. It's traditional town from 7th century and this certainly remains in the atmosphere with Sensoji Temple, the biggest temple in Tokyo, being here. Due to this, Asakusa is very famous and many tourists come out here in the daytime, but how about at nighttime? In the evening, very few foreigners walk around Asakusa and many Japanese people come out. After work, Japanese "salary-men" come to Asakusa to drink, laugh and chat. 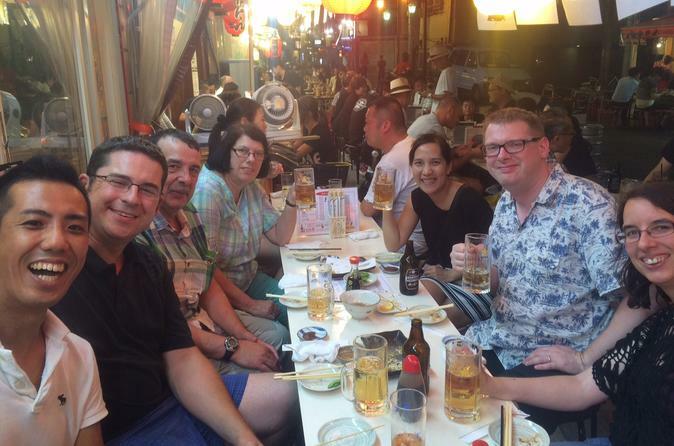 Let's drink local alcohol and eat delicious Izakaya food as locals with our professional and friendly guide! Many local foods are waiting for you to try them!